K & C Collectibles has added New Egg Attack 6 inch figures, Black Series 6 inch figures, TOPPS Black & White Trading Card box, Star Wars Insider, Gentle Giant Bust, Sideshow collectibles and Real Action Hero figures this week. Click the NEW PRODUCTS link under the Categories Section for a complete list of recently added items. Starting today through midnight Halloween October 31st, 2017 K & C Collectibles is offering 15% discount on all in-stock merchandise. The redemption code is Halloween. In addition we are offering FREE shipping for those orders over $100 when your shipping address is within the continental USA. New: Jango Fett mini bust, Jumbo Han Solo in Carbonite, Star Wars insider #176 Comic shop exclusive cover. Click the NEW PRODUCTS link under the Categories Section for a complete list of recently added items. K & C Collectibles has added Gentle Giant Status, Star Wars Insider, SDCC 2-pack Black Series, The Last Jedi Black Series 3 3/4″ and 6″ action figures, 3.75″ regular action figures, Deluxe 2-packs and Deluxe Figure Sets. Click the NEW PRODUCTS link under the Categories Section for a complete list of recently added items. 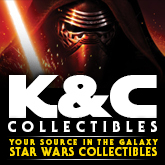 K & C Collectibles has added New First Order Stormtrooper Two Pack, Wind-Up Toys, Kylo Ren Sleeping Bag, Death Star & Millennium Falcon Billfolds, Star Wars Insider Comic Cover & Newsstand edition #166 and The Empire Strikes Back Micro Comic Collector Packs. Click the NEW PRODUCT link for a complete list of recently added items.